Join us for Two Great Events, FRIDAY, 9/15! For the 10th year in Philadelphia and the 2nd year at Friends Center, join us as we convert a parking space on 15th Street into a temporary “parklet” and reclaim public space for people not cars. Thanks to Friends Council on Education, Friends Assoc. for Higher Education, Friends World Committee, & CASA for volunteering on our parklet. Click here for info & a map of all Park(ing) Day sites. While summertime is now a memory, we’re ordering in some tasty barbecue as a last bit of summer for you, our wonderful tenants! There will be veggie options as well as meat ones, plus yummy side dishes. So bring an appetite and meet some of your fellow Friends Center-ians. Managing water is a big part of Friends Center’s green building practices. Recently we installed a “hydration station” on the first floor, where both tenants and event customers will use it. We’re excited to have a bottle filler now! As of this writing, the counter says we have saved the use of 860 bottles. Keep it up, friends! At a much larger scale, we manage as much stormwater here on site as possible with a green roof and a graywater system. Our goals are to reduce use of potable water, and to reduce our discharge into the city’s water treatment infrastructure, in keeping with the city’s “Green City, Clean Waters” plan. 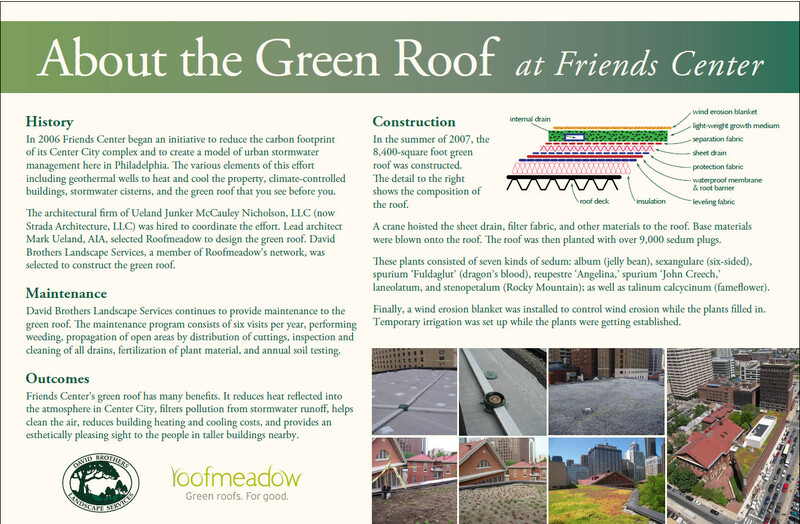 The green roof is located on the 1501 Cherry Street building. Seven species of sedum, a succulent plant, grow in a layer of soil on top of an impermeable membrane. The soil and plants hold rainwater, reducing runoff into storm drains and also lowering the temperature of the roof, especially in summer. It’s also an urban haven for insects and birds. Seven large cisterns in the basement of the Quaker Meetinghouse collect rainwater from its roof. This “graywater” is pumped over to the 1501 Cherry Street office building to flush the toilets, thus saving thousands of gallons of the city’s freshwater resource every year. Finally, most of the bathroom faucets and some of the fixtures in the 1501 Cherry building have automatic on/off sensors to keep water from running when no one is there. Of course, if you see a leaky faucet, toilet, or other fixture, please let our staff know right away so we can fix it and prevent water waste or damage. Friends Center recently engaged a volunteer team from the Community Design Collaborative to do a feasibility study for improvements to the 1520 Race Street building. Their final report will be shared with the Friends Center board of directors soon, and we will explore options. Meanwhile, here is the Collaborative’s summary of the study. On September 1, American Friends Service Committee, one of the three Quaker organizations that formed Friends Center, welcomed Joyce Ajlouny as their new General Secretary. Friends Center congratulates Shan on her retirement, and thanks her for her service as a Friends Center board member during her tenure. Art-Reach premieres its first documentary film, I Am, at the Prince Theater, 9/19, 6 pm. The film follows the journey of 6 students from St. Katherine’s Special Education School and 8 dancers from the Pennsylvania Ballet’s Second Company to create an original ballet. Michael Lee describes how he founded PLSE to advocate for a more equitable social environment for those with criminal records, including expanding access to employment and social services. For over half a century, Singing City has been Philadelphia’s premier avocational chorus, committed to bringing people of diverse races, creeds and backgrounds together under the common purpose of music making. Singing City both rehearses and has its office here at Friends Center.